Here's a wonderful new online slots game by Yggdrasil Gaming, as you engulf in this thriller of a Halloween slot. A brand-new creation by the pacesetters Yggdrasil Gaming. Where you can experience the full horror/excitement mix that Halloween brings to us all. Now, you’re not a kid anymore so you shouldn’t really be going out trick-or-treating! But the developers at Yggdrasil understand that Halloween is a big deal to a lot of people young or old, everyone should have the right to enjoy it in their own way, and that way is Pumpkin Smash. The fantastic 5-reel new fruit machine game, with superb spooky bonuses that will have you fist-pumpkin the air, so what are you waiting for? Put on your ghostliest costume and fill your bag with cash. It’s no secret how impressed the iGaming industry is with Yggdrasil’s remarkable rise since receiving their first gambling licence back in 2013. With the providers being still such a young figure in the market, their games certainly do not reflect that. The quality of their games is quite extraordinary, enough so to overshadow some of the better games produced by developers who have been in the game much longer than the Yggdrasil team. Pumpkin Smash reflects beautifully what the developers are trying to achieve in the online slot market, a depth of gameplay that continues to push Yggdrasil to new heights. The scale of the developer’s growth is game by game, rather than year by year, they have every chance of ending up at the top. Visit SlotsBaby for promos and updates! 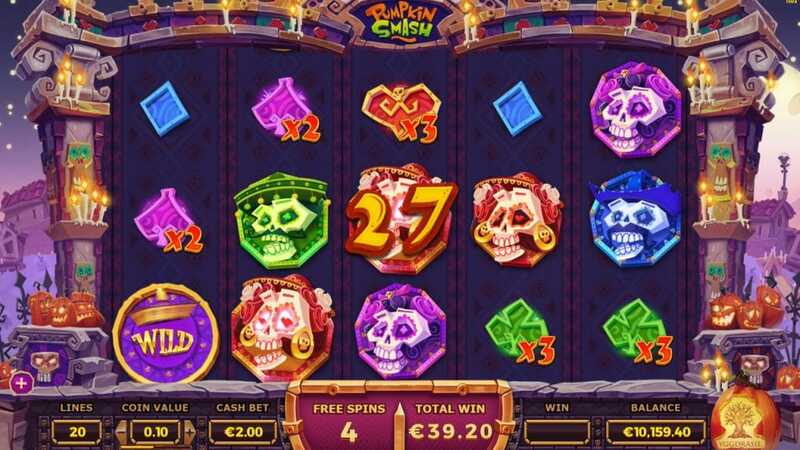 Pumpkin smash is not a trick, just a treat for all your avid slots players out there. A smashing video slot game that you could argue that after once playing, is the best they’ve produced to date. The ‘Day of the Dead’ Mexican theme combined with a Halloween dressing is genius work from the game providers, turning a scary theme into a celebratory style appearance with a mixture of bright colours and vibrant effects but keeping the gloomy features that you would associate with Halloween. 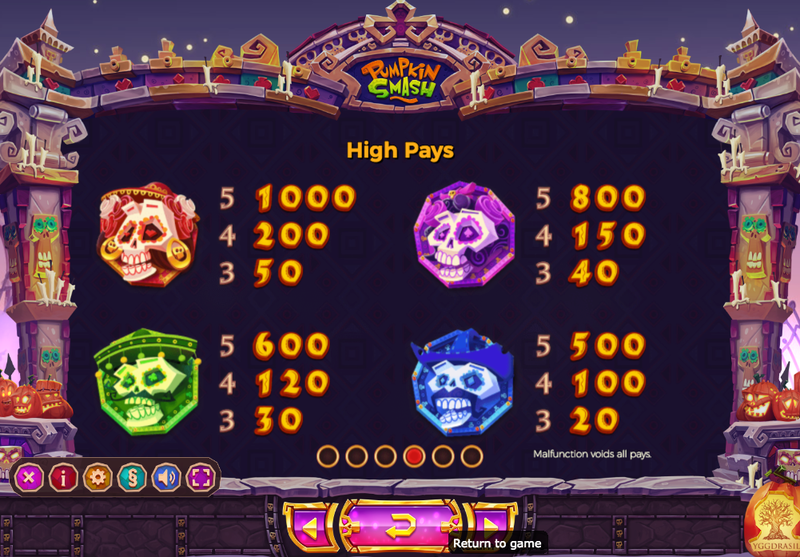 The gameplay itself contains 5-reels with 20 pay lines, the playing card symbols that match on the reels will provide you with the smaller win amounts whereas the Pumpkin heads and the Wilds represent the greater values. BEWARE FOR THE KOOKY PUMPKIN BONUS SYMBOL! (Sorry, just getting into the theme). It’s nothing to fear as this will trigger the bonus rounds where you can smash the pumpkin heads to claim your prizes, the more you find, the more you get to smash and win.